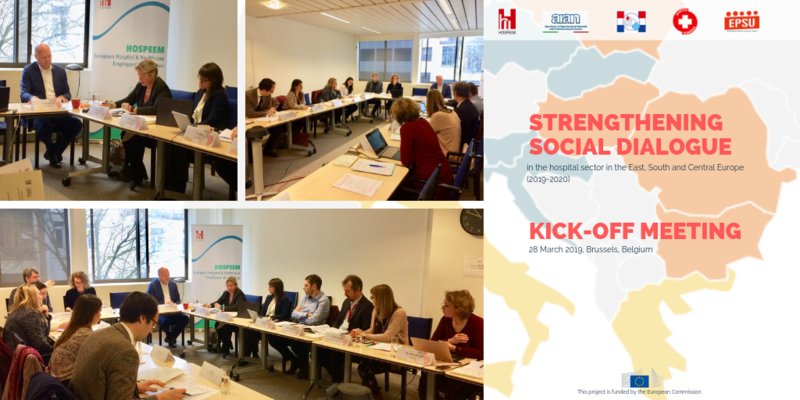 On 28 March 2019, HOSPEEM, EPSU and the project partners, Sanitas (EPSU affiliate, Romania), ARAN (HOSPEEM member, Italy) and HSSMS-MT (EPSU affiliate, Croatia) hosted the kick-off meeting of their new joint project in the field of sectoral social dialogue capacity building: “Strengthening social dialogue in the hospital sector in the East, South and Central Europe”. The meeting was the occasion to discuss the capacity building needs of sectoral social partners in the hospital sector in the three targeted regions as well their involvement in the European agenda, including the European Semester. The need to strengthen representativeness of the sectorial social partners activities also by sharing best practices, ensuring a bottom up approach and the need to foster the capacities of social partner organisations for social dialogue to be successful were among the topics discussed. The importance of guaranteeing the link between the sectoral social partners’ national priorities and the European Semester process was raised by the participants. It was highlighted how social partners should be supported in creating and ensuring a social dialogue infrastructure, an enabling political and social environment where they can identify their priorities and bring them to the EU level. The event gathered around 20 participants, governments’ representatives from the Permanent Missions to the EU, and DG EMPL representatives from the Social Dialogue Unit and from the Unit on Employment and social aspects of the European Semester. The agenda of the meeting, the presentation of the project and the overview of the main HOSPEEM and EPSU joint activities in the European Sectoral Social Dialogue are now available. 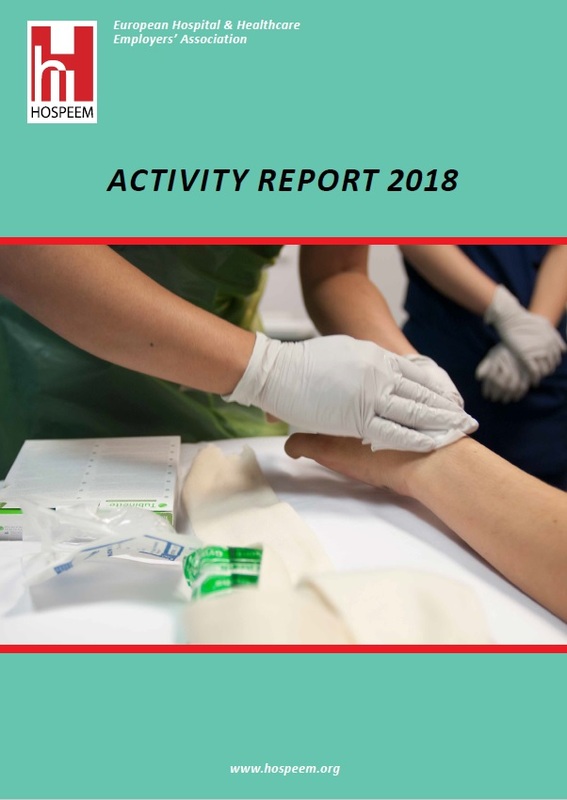 The HOSPEEM Activity Report 2018 is published. This activity report presents basic information on HOSPEEM and the main activities carried out during the year. 2018 has been a year rich in achievements for HOSPEEM ensuring that the views of hospital and healthcare employers are being heard at the highest level. Firstly, HOSPEEM and EPSU celebrated the 10-year anniversary of the Code of conduct on Ethical Cross-Border Recruitment and Retention in April 2018. Secondly, the conference “A sound mind in a sound body- Taking care of those who take care of us” has been organised in Vilnius on musculoskeletal disorders and psychosocial risks and stress at work in May 2018. Thirdly, a dissemination workshop on Occupational Safety and Health and Continuing Professionnal Development took place in the European Parliament in Brussel, hosted by two MEPs in December 2018. In order to ensure large visibility to this tender, HOSPEEM and EPSU will publish the tender on their websites. This tender will be publicly available for 21 days. Support is being sought from an external team of experts to help to facilitate the implementation of the project run by the EU-level social partners in the hospital/health care sector EPSU and HOSPEEM. The contractors will carry out research, in the form of a survey, to gather information on the priorities of the employers’ organisations and the trade unions and how they could be better articulated in future activities of HOSPEEM and EPSU. The research will also cover on information on the current involvement of the sectoral social partners in the European Semester with the aim to strengthen their role in this regard. The findings of this research will be presented at the regional capacity building workshops in form of draft factsheets. The subcontracted team of experts will also be responsible for the capacity building with social partner organisations in the respective countries and will assist in the organisation of the regional workshops in Bucharest, Rome and Zagreb. HOSPEEM and EPSU also expect the contractors to assist with the coordination of the project to ensure good outcomes. Drafting the survey addressed to national social partner organisations in the hospital/healthcare sector in the targeted countries after liaising with the project partners. The final fact sheets should build on desk research as well as the surveys of the member organisation and other contacts of HOSPEEM and EPSU. In order to perform the tasks listed above, the subcontracted team of experts will be asked to work for a total of 40 days. Particular expertise in the healthcare sector will be considered as an asset. Next to contributing effectively to the success of this project, the contractor has to ensure a non-discriminatory work environment, including gender equality within the subcontracted team of experts. The project duration is from February 2019 until January 2021. Draft fact sheets must be made available no less than 2 weeks prior to each workshop. The workshop reports should be prepared within one month after the workshop. A final project report taking into account proceedings at the dissemination workshop is required by December 2020. The total budget for the Expertise is 24 000,00 EUR (all taxes and charges included). HOSPEEM will sign a contract with the subcontracted team of experts. Payments will be made in three instalments dependent on the contractors carrying out the relevant stages of the work as listed above. A first payment of 20% of contract value on signature of the contract, a further payment of 40% of contract value on completion of the reports from the first two regional capacity building workshop (end of 2019) and a final payment of 40% upon finalisation of the project and delivery of the report from the third regional capacity building workshop and the final project report. The travel and accommodation expenses for the contractor to attend the project conferences or meet with the EPSU and HOSPEEM Secretariats will be covered by the overall travel and accommodation budget of the project and paid separately from the above-mentioned instalments. The contract will be awarded to the tenderer who is offering presents the best value for money, taking into account the specific criteria set above. The principles of transparency and equal treatment with a view to avoiding any conflict of interest will be respected. Tenders must be written in English. They must be signed by the tenderer or his duly authorised representative and be perfectly legible so that there can be no doubt as to words and figures. Tenders must be clear and concise. Specific information concerning the proposed methodology for delivering the tasks listed in part 2. Prices of the financial proposal must be quoted in euros, including if the sub-contractor is based in a country which is not in the euro-area. As far as the tenderers of those countries are concerned, they cannot change the amount of the bid because of the evolution of the exchange rate. The tenderers choose the exchange rate and assume all risks or opportunities relating to the rate fluctuation. Prices shall be fixed and not subject to revision during the performance of the contract. Offers must be received within 21 days of the date of publication of this call for tender by HOSPEEM, i.e. by 22 February 2019. Offers must be sent to HOSPEEM in both formats: electronic (by e-mail to s.mohrs@hospeem.eu and hospeem@hospeem.eu) and as a paper copy (see contact details below). To ensure confidentiality, bidders must submit their offer in a sealed envelope. If self-adhesive envelopes are used, they must be sealed with adhesive tape crossed by the signature of the sender. The project will provide an appropriate framework to address capacity building needs of social partners in the following 14 countries: Bulgaria, Hungary, Poland, Romania, Cyprus, Greece, Italy, Malta, Portugal, Spain, Croatia, Czech Republic, Slovakia and Slovenia, by exchanging on and collecting their priorities and challenges that they are facing at national level. Three Regional Workshops are planned between June 2019 and June 2020 as well as a dissemination workshop in Brussels by the end of 2020. A report, containing the outcomes of the workshops and the conclusions drawn during the final dissemination event will be produced, along with other supporting materials (e.g. fact sheets for each targeted country and videos). In implementing this project HOSPEEM and EPSU wish to promote a “bottom-up” approach in the capacity building process. The information gathered during the project will be fed back into the regular meetings of the Sectoral Social Dialogue Committee for the Hospital Sector (SSDC HS). Core priorities of the sectoral dialogue between EPSU and HOSPEEM for the targeted regions will be discussed and evaluated, also in view of their use to influence EU-level policy makers. HOSPEEM and EPSU have been provided with financial support from the European Commission for a joint project in the field of sectoral social dialogue capacity building: “Strengthening social dialogue in the hospital sector in the East, South and Central Europe” in the years 2019 and 2020. The project will provide an appropriate framework to continue addressing capacity building needs of social partners. The work will serve to help build the capacity of the hospital sector social partners in 14 targeted countries (Bulgaria, Hungary, Poland and Romania, Cyprus, Greece, Italy, Malta, Portugal and Spain, Croatia, Czech Republic, Slovakia and Slovenia) by exchanging on and collecting the relevant topics and priorities in view of the EU-level sectoral social dialogue. It will also be instrumental to discuss and evaluate the core priorities and outcomes of the sectoral dialogue between EPSU and HOSPEEM for the targeted regions, and to assist in feeding into the sectoral social dialogue committee for the hospital/healthcare sector (SSDC HS) the social dialogue interests and important topics in a “bottom-up” process to support the aim of building capacity. The project will run over 24 months. This will allow the delivery of a full project cycle including preparatory activities, the implementation of the work plan and the dissemination of results already fully under the project (not excluding further dissemination efforts after the end of the project). The project foresees the organisation of three Regional Workshops, the first in June 2019 in Bucharest (Romania), the second in November 2019 in Rome (Italy) and the third one in Zagreb (Croatia). The preparation and organisation of the first event will be supported by Sanitas (EPSU affiliate, Romania), the second by ARAN (HOSPEEM member, Italy) and the third one by HSSMS-MT (EPSU affiliate, Croatia). Furthermore, a dissemination workshop will take place by the end of 2020 targeted to a wider audience in Brussels (Belgium). Orientation and guidance will be provided by an Advisory Committee composed by representatives from the affiliated associations Sanitas, ARAN and HSSMS-MT. The Advisory Committee will have the task – together with a team of expert to be contracted – to help the Secretariats to prepare, support, monitor and evaluate project-related activities. As main deliverables, the project will produce a report from each Regional Workshop to be drafted by the expert and to be agreed upon by the Advisory Committee and the HOSPEEM and EPSU Secretariats. Another deliverable is a final report summarising the main insights, conclusions and recommendations from the three Regional Workshops and the final dissemination workshop. Video-recorded interviews of the Advisory Committee members, participating in the three Regional Workshops as well as other stakeholders attending the workshops. The information gathered the outcomes of the workshops’ debates, the contents of the reports on the Regional Workshops will be fed back into the regular meetings of the Sectoral Social Dialogue Committee for the Hospital Sector (SSDC HS) to be further discussed and assessed, in particular in view of their use to influence EU-level policymaking. EPSU also has set up a page with the project-related information. In their first Working Group meeting of the European Social Dialogue in the Hospital Sector, on 04 April 2018 HOSPEEM and EPSU looked back to the signing of the EPSU-HOSPEEM Code of Conduct on Ethical Cross-Border Recruitment and Retention on 8 April 2008 and renewed their commitment to promote, guarantee and defend decent recruitment and working conditions for migrant workers, from the EU and from outside the EU, in hospitals and healthcare facilities across Europe. HOSPEEM and EPSU issued a Joint Media Release on the 10 years anniversary of the Code of Conduct. 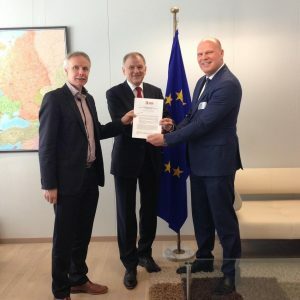 It represents an important instrument to support the free movement of workers across the European Union while preventing unethical competition between the Member States and employers in terms of cross-country recruitment process, fair and transparent contracting and the induction of migrant workers at the new workplace. This also holds for their equal and non-discriminatory treatment regarding labour law, social protection provisions and the access to training and career progression and the freedom of association. The EPSU-HOSPEEM Code of Conduct on Ethical Cross-Border Recruitment and Retention was inspired by social partner-based or/and public policy tools already in use in different European Union Member States. At international level, the World Health Organisation (WHO) on 21 May 2010 adopted and set into practice the WHO Global Code of Practice on the International Recruitment of Health Personnel. The Global Code, non-binding in nature, addresses a number of similar issues already covered with in the EPSU-HOSPEEM Code of Conduct. In the meeting on 4 April 2018, HOSPEEM and EPSU members reiterated their commitment to the 12 key principles of their 2008 Code of Conduct and to the promotion of ethical recruitment and retention practices at European, national, regional and local level in the upcoming years, both in their own work and in the broader context of the European Pillar of Social Rights. At the meeting on 4 April 2018, several HOSPEEM members and EPSU affiliates commented on the use and positive effects of the EPSU-HOSPEEM Code of Conduct on Ethical Cross-Border Recruitment and Retention. They also referred to different models of how the 12 principles of the Code of Conduct have been incorporated in their national contexts, either into legislation, by means of collective agreements and/or by using enterprise-based agreements. EPSU has also published an article on the event and the 10-year anniversary celebration. In this document you can find the highlights of the work of the HOSPEEM-EPSU Sectoral Social Dialogue Committee for the Hospital and Healthcare Sector. In 2017 the Sectoral Social Dialogue Committee for the Hospital and Healthcare Sector dealt with a wide range of topics in the framework of the EPSU-HOSPEEM Joint Work Programme and carried out project-related activities. 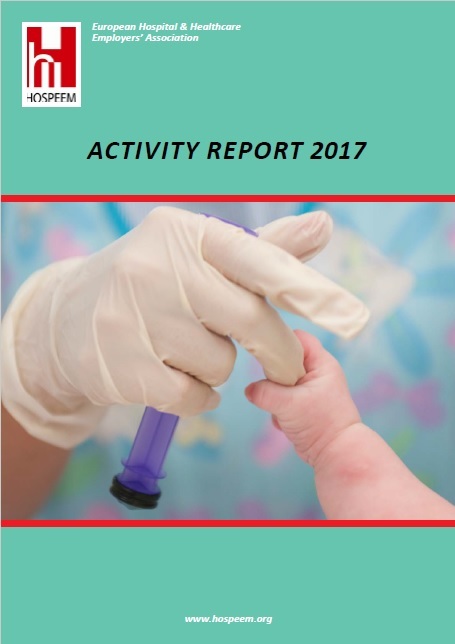 The HOSPEEM Activity Report 2017 is published. This activity report presents basic information on the history of HOSPEEM, on the membership structure as well as on the main activities carried out during the year. 2017 has been a productive year with a number of achievements: the start of the new joint HOSPEEM-EPSU project on effective recruitment and retention policies including the June conference “Working together, learning together – Switching to the learning mode”, the start of the HOSPEEM-EPSU new work programme 2017-2019 for the European social dialogue, the high-level metings with European Commissioner Vytenis Andriukaitis and the Bulgarian Minister of Health Prof. Nikolai Petrov, the joint HOSPEEM-HOPE workshop “AMR and workplace learning – The case for a multi-professional approach in hospitals” at the European Parliament. VADEMECUM – A Practical Guide for EU Social Partner Organisations and their National Affiliates to Commission support to EU Social Dialogue. The “VADEMECUM – A Practical Guide for EU Social Partner Organisations and their National Affiliates to Commission support to EU Social Dialogue -2017” provides basic information on the instruments related to EU support to social dialogue and includes the existing rules to be respected when using these tools. Download the guide. “Health has social, environmental and behaviour determinants. We need to address public health with ambition: prevent deterioration of health and avoidable deaths, invest in health promotion and prevention. The EU together with Member States could save thousands of lives each year. Social partners can play a central role in this process. Be sure that I am one of you.” said European Commissioner Vytenis Andriukaitis. This passionate response came in a meeting with HOSPEEM and EPSU Secretary Generals, Mr. Tjitte Alkema and Mr. Jan Willem Goudriaan. The representatives of the employers and trade unions met with the Commissioner responsible for health and food safety to discuss their joint work on Continuing Professional Development (CPD) that culminated in the signing of the Joint Declaration by HOSPEEM and EPSU in November 2016. EPSU and HOSPEEM informed the Commissioner about their joint upcoming conference on CPD in June 2017 and invited him to their second conference scheduled to take place in April or May 2018 in Vilnius dealing with the two most widespread health and safety hazards in the health care sector, namely musculoskeletal disorders and psycho-social risks and stress at the workplace as well as on patient safety. The Commissioner expressed his support for the Joint Declaration and more generally also for the work of the EU-level sectoral social dialogue partners for the hospital/health care sector that recently adopted their work programme. 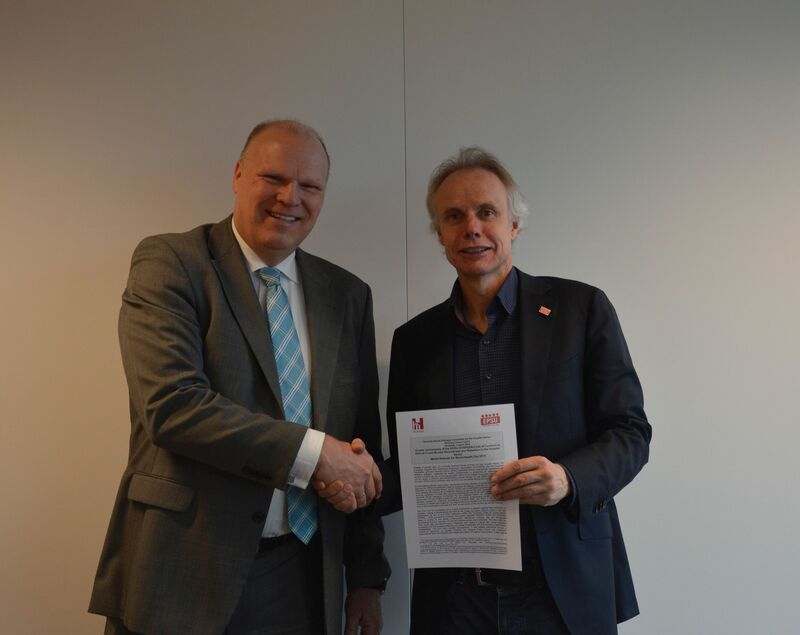 He added that social partners should keep the Joint Declaration on CPD for All Health Workers in the EU on the agenda of EU Member States and of the Council of the European Union. EPSU and HOSPEEM also exchanged on the possibilities to coordinate or join up forces to follow-up to the recommendations of the Report of the UN Commission on Health Employment and Economic Growth and on the need for more public investment in health care. The meeting took place on 24 April 2017. The Commissioner was accompanied by Annika Nowak, Member of Cabinet and Concetta Cultrera, DG SANTE. 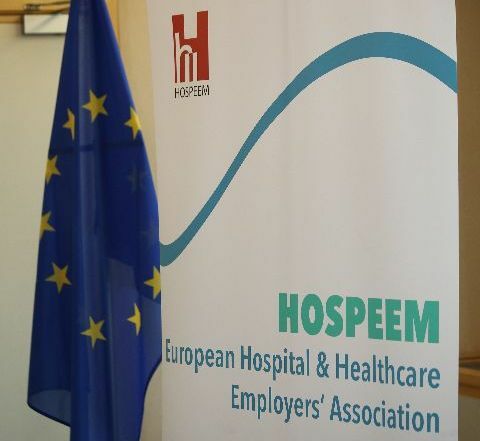 The European Hospital and Healthcare Employers’ Association (HOSPEEM) represents national employers’ organisations operating in the hospital and healthcare sector at the European level. Let’s build the future of hospital care!